I know that many people have already started to think about fall. But around here, summer is showing no signs of stopping. We’re currently in the middle of a marathon-like stretch of hazy, hot and humid weather. And I find it hard to even imagine that a change of seasons is creeping up on us. I love these long, hot summer days and their seemingly endless daylight hours, trips to the pool and drippy ice cream cones. But I must admit that it’s a struggle to find the motivation to cook meals when the weather is this oppressive. Especially when all I want to do is sit down with a half a watermelon and a big spoon. But since I don’t think anyone needs a recipe for how to eat a half a watermelon, I decided to share with you this watermelon-based smoothie recipe that I’ve been making on a regular basis. Because it’s exactly what these last remaining days of summer call for! 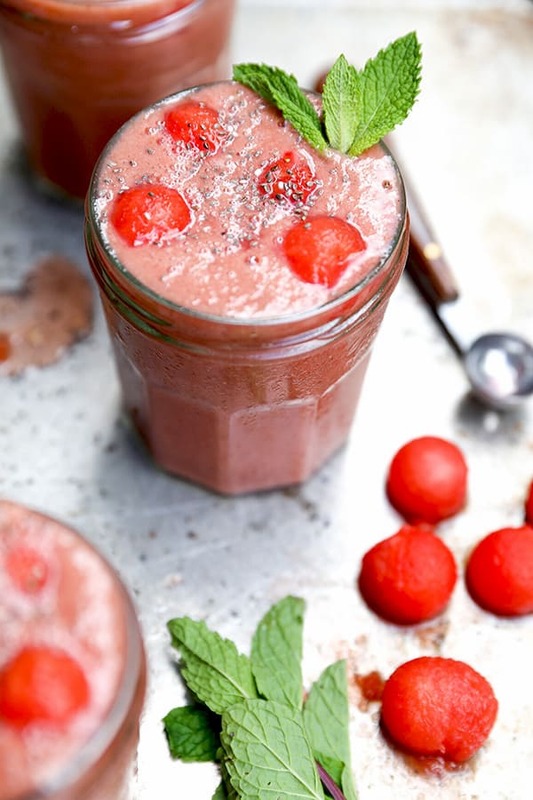 This vegan Watermelon-Strawberry Smoothie is perfectly cool, refreshing and fruity. But I think the thing that gets me the most excited is the pink hue. In general, I don’t consider myself to be a girly-girl. But I can’t seem to resist anything this color. It just makes me smile. I used a frozen banana and frozen strawberries to help thicken this smoothie, along with a 1/2 cup of light coconut milk to give it a more creamy consistency. I also decided this was a good opportunity to pull out my melon baller. I created some fun garnishes with the extra watermelon that I had, which I added to the glasses right before serving. And while this step is totally optional, I think it makes this smoothie so much more fun. So if you’re like me and you have a melon baller that only gets used three times a year, this is your chance to get it out of hiding! 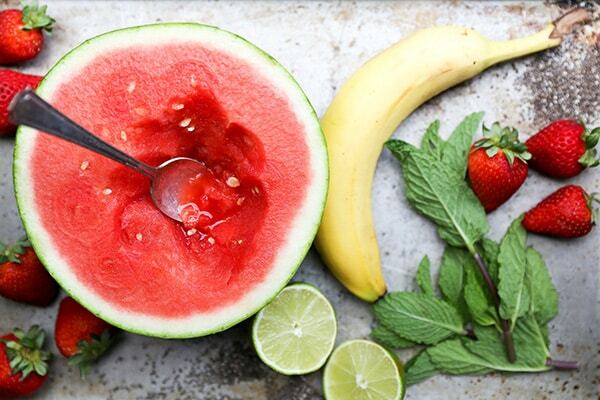 A refreshing vegan watermelon and strawberry smoothie that will cool you off on even the hottest summer days. Add all of the ingredients to your blender and process on high until smooth. Pour into glasses. Garnish with watermelon balls, chia seeds and a few fresh mint leaves, if desired. Serve immediately. What a sweet and refreshing looking smoothie! I want to be sipping on this right now! This smoothie combination is so refreshing and awesome..It looks so yummy in photos ..